So far, we’ve been impressed by a number of rad new wheelchair designs, but do you know what’s even better than cruising around in a nice new wheelchair? A toe-stomping exoskeleton that allows paraplegics to walk around and plow down every last thing in their way, that’s what. 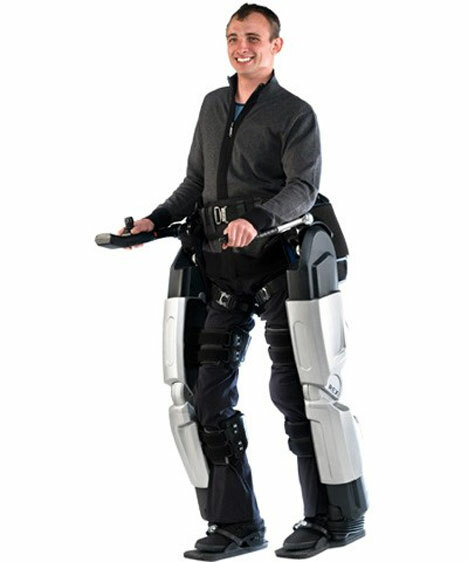 A New Zealand company designed Rex (or Robotic Exoskeleton) to help disabled people regain the ability to walk again. It’s easy enough for the user to transfer himself from wheelchair (or chair, or bed) into Rex. Then, using just a joystick and a few simple shifts of body weight, the user can navigate flat surfaces, ramps, slopes and even stairs with ease. Rex is the result of more than seven years of research and development by two engineers who both grew up with wheelchair-using mothers. The Rex isn’t just a vision of futuristic mobility; it’s going to go on sale in New Zealand this year. The company is seeking FDA approval that will allow them to sell the device in the United States. The starting price of $150,000 might be a bit too steep for some users, but maybe it makes sense since the device is giving people an unexpected chance to walk again. See more in Cybernetics or under Technology. July, 2010.